This dessert is one of my favorite no bake pie recipes! 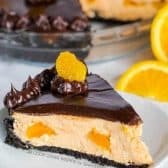 It starts out with a chocolate cookie crust filled with an amazing no bake orange filling and then it’s topped with a rich chocolate ganache! Place Oreo cookies in a food processor and pulse until crushed. Add in melted butter and continue pulsing until well combined. Press into an 8" pie pan and refrigerate. Pour 1/2 cup orange juice into a 1 cup measuring cup. Add enough ice to fill the measuring cup. Pour into the jello and stir until slightly thickened. Remove any remaining ice. Whisk in whipped topping and refrigerate until it can hold its shape (about 20 minutes). Mound 1/2 of the orange filling into the crust. Top with mandarin oranges and remaining Jell-o mixture. Refrigerate at least 30 minutes or until set before adding ganache topping. Heat heavy cream to boiling. Pour over chocolate chips and let sit for 4 minutes without stirring. Whisk until the mixture becomes dark and thick. Let cool for a few minutes if needed (to ensure it won't melt the pie). Pour approximately 1 cup of ganache over the pie. Let cool on the counter 20-30 minutes. Refrigerate 4 hours or overnight. Cool remaining ganache to room temperature. Place in a piping bag and pipe along the edges of the pie. Top with reserved orange slices. To easily cut through the ganache, run your knife under hot water before each slice. NOTE: The pie does not set up as well with light/sugar free products.